View our Limited-Time Email Specials to find great opportunities to save on your favorite Shopsmith products! WATCH IT! See the MARK 7 In Action NOW! Dream It! Build It! Share It! Shopsmith® offers a wealth of education, training and tools which will make your next project easy and fun. My Shopsmith is absolutely amazing! I find it extremely easy to operate because it is so logical and precise. And the manuals and course book are so well organized, I just can't go wrong. 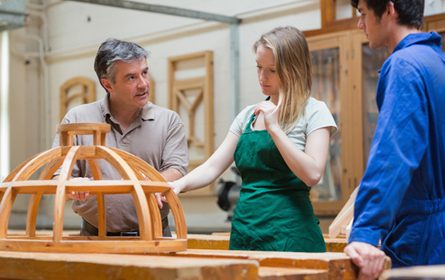 Dedicated to Improving Lives Through Woodworking For More Than 65 Years! THE NEW, 7-IN-1 TOOL MARK 7 - Much more than just a Table Saw or Lathe! “I Love My Mark 7. It has saved me thousands of dollars by allowing me to completely rebuild a wooden fence myself.” Jim S.
MARK V's and new MARK 7's may look alike but they're NOT! The Mark 7 includes the New PowerPro headstock and the 7 most valuable woodworking tools to have in your shop. The Mark 7 will allow you to tackle all your projects with one machine. And, if You have the Mark V you can upgrade to MARK 7 Standard including the amazing new PowerPro® Headstock. Not Your Grandfather's Tool Anymore! Get Accessories, Parts & Upgrades! “My Dad owned a Shopsmith, I own a Shopsmith, and my son is building his own wooden canoe with our new Mark 7.” Tony B.
Shopsmith products sustain the test of time by providing the ability to upgrade older machines to modern standards. No other company offers that! And, if you want to increase your capabilities, Shopsmith has accessories for every woodworking operation. From Bandsaws to Biscuit Joiners you can customize your machine your way. “The PowerPro has been an excellent upgrade for my Shopsmith. So much power and speed! I recommend this upgrade.” Steve B. The new Powerpro provides greater precision by giving you infinitely variable speeds from 250 to 10,000 RPM with twice the torque at a constant rate through its full range at the press of few buttons. Shopsmith helps you tackle all your projects with improved results. No Other Machine Does This! “Shopsmith Representatives are really knowledgeable and have great ideas on easy ways to get the results I want” DeShea C.
If you need training, Shopsmith provides support to tackle any job including the industry's most comprehensive Owner's Manual. Great Tool. Great Ways to Learn. 7 Tools in 1 - Table Saw, Lathe, Disc Sander, Drill Press, Horizontal Boring, Router, Shaper. Switch From Tool-To-Tool FAST - 12 to 98 Seconds! Manufactured in the USA, our Shopsmith Abrasives are designed for comfort and ease of use. Combine that with our other Shopsmith products and you have a “must-have” tool!